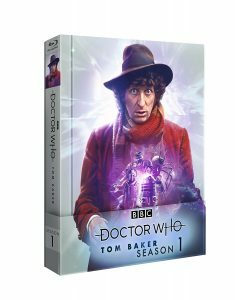 Doctor Who: Tom Baker Season 1 on Blu-ray! For the first time, classic episodes from the Tom Baker years of Doctor Who will be released on Blu-ray in the U.S.! Tom Baker’s entire first season, Season 12 of the classic series, will be released as a single unit as Tom Baker Season 1, consisting of 6 discs. All the episodes, plus all the extras that were on the individual DVDs will be included. In addition, all new extras will be added, including an all new candid interview with Tom Baker; “Behind the Sofa”, watching various clips with Tom Baker, Philip Hinchcliffe, Louise Jameson, Janet Fielding, Sarah Sutton and Sadie Miller; new “making of” for “The Sontaran Experiment” and “Revenge of the Cybermen”, and more! If this sells well, we can expect more such releases of the classic series!